With the Heat's loss to the Wizards tonight, the Pacers have officially clinched the top seed in the Eastern Conference playoffs. In the East, the race for the number one seed has been a two horse contest for much of the regular season. 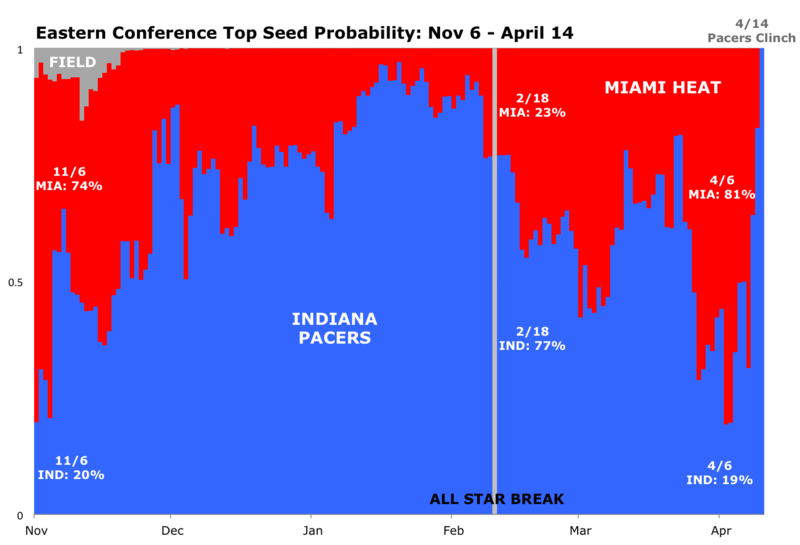 The chart below summarizes how the top seed probability has sloshed back and forth between the Heat and the Pacers. Miami opened the season as the favorite, with a 74% probability. Thanks to a very strong start, the Pacers quickly supplanted the Heat as the prospective top seed favorite. They maintained that frontrunner status from early December on through to the All Star break. And then the Pacers chances, once as high as 97%, began to crumble. By April 7, with just a week and half of games left, the Heat had recaptured their pre-season status as the Eastern Conference favorite, with an 81% probability of achieving that top seed. But the Heat found it just as difficult to stay on top, and in the past four days saw their chances drop from 69% to 0%. Here is the tug of war in chart form (and here it is in motion if you find static images and the written word insufficient to hold your attention). Blue represents the Pacers' chances, red for the Heat, and that sliver of gray in early November the combined chances of those teams that do not play their home games in Miami or Indianapolis. Playoff seed probabilities come from my team rankings and daily simulations of the remainder of the regular season.